Replaceable and easy to install. The cast iron plates from DWS are lighter weight and cast from an extremely durable ductile iron. They are designed for use in cold harsh climates with snow removal concerns. The plate design allows for easy installation and simple replacement should the need ever arise. Unique design with incorporated anchor bars allows for lighter weight, easier installation and replacement of the plates if ever needed. Step 1 – Finish wet concrete to ramp and street level height. Step 2 – Place Cast Iron plate in required location, generally 2 – 6 inches from the street or curb & gutter. Step 3 – Embed plate into the concrete by pressing, using a rubber mallet, or standing on the plate. Imbed so surface of the plate is flush with the surrounding concrete. Step 4 – Finish concrete around the plate. We recommend the uncoated cast iron panels which weather to a natural patina color. Coated panels are available in yellow, brick red and gray. 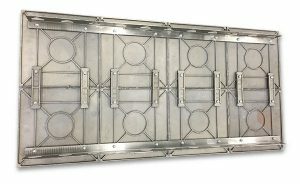 Mats are available in the following sizes: 2’x2′, 2’x3′, 2’x4′, 2’x5′, 10′ radius wedge, and the 15′ radius wedge for radius applications.